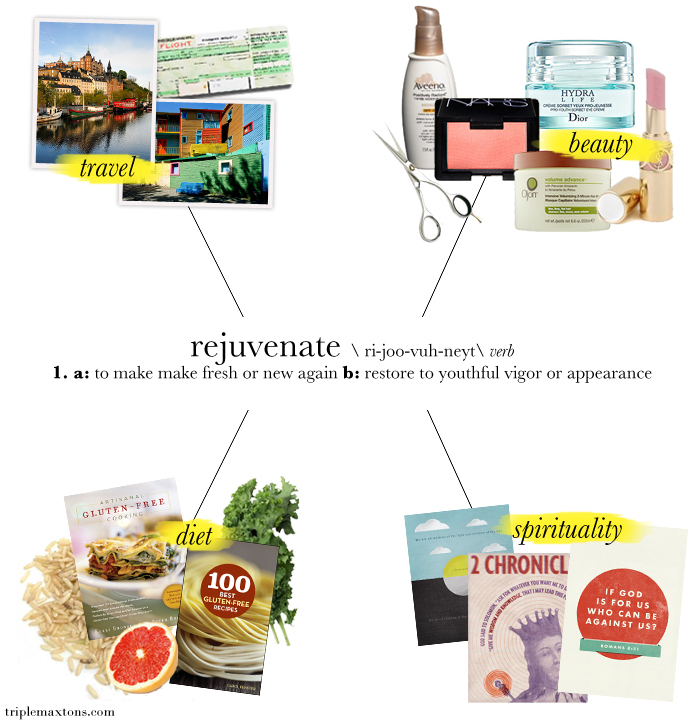 My second resolution of 2012 is all about rejuvenation - of my mind, body, soul, and lifestyle. Few things excite me like a trip abroad, yet they rarely come about...money and time always seem to make them nearly impossible. The beautiful sights, the awkward/awesome cultural exchanges, the different foods, and hilarious events that always come about when traveling...fingers crossed I get to experience that in 2012. Right now, Sweden is on the top of my travel wish list - it's where my mom's side of the family is from, and I have been hungrily taking in all of the amazing footage from Sweden in the "Girl With the Dragon Tattoo" movies. Argentina is also up there on my list...bring on the gauchos, yerba mate, and the tango! I went to the dermatologist for the first time this year for reasons that were purely vain. My skin was totally lackluster, the texture was no longer smooth, and my fine lines were beginning to look more like a map of Austin's interstate highways! Ahh the perils of entering your mid-20's, haha. Anyways, the most important instructions uttered by my derm: wear sunscreen everyday. She also told me to get a Clarisonic (and to accept no imposters), which my mom bought me for Christmas and I highly recommend. My skin is already softer, and the products absorb into my skin so much better than before. It's worth every single penny. As for other little changes you can do to freshen things up for the new year, a hair cut and a swipe of bright lipstick are sure to do the trick. If you are what you eat, I am most certainly chicken, cereal, crackers, cheese, pizza, cupcakes, and salad. It's not necessarily the worst diet you can imagine, but it's not the healthiest either. Just need to cram more veggies and less dairy in there. I'm going to attempt to go gluten-free to see if that has any effect on my energy levels and overall health. I can already tell it's going to be a toughie, and there is a total learning curve (baking with xanthan gum, anyone?!) that will definitely take some getting used to. The Artisanal Gluten-Free Cookbook and 100 Best Gluten-Free Recipes cookbook are both on my list to check out. This is so often a part of my life that gets pushed to the side when things get busy, and it is something that I really want to move to the forefront. John and I were so lucky to have found a Church here in Austin that we really enjoy, and I'd like to become a more active member within it...learning more about Christianity through the Bible, putting words into action, and finally getting baptized! Love it. So far as booked for 2012, I have Mexico and the Netherlands to be finalized. Fun! And I've had my eye on a Clarasonic...might take your word for it and bite the bullet. Gluten-free is tough. Let me know if you feel any different on it! These are wonderful resolutions for all of us-- I'm taking notes! I was moved to comment because I love the way you organized/styled the inspiration photos. I'm off to make my own inpiration board!